No school. Gotta fill the days. Let’s make cookies! 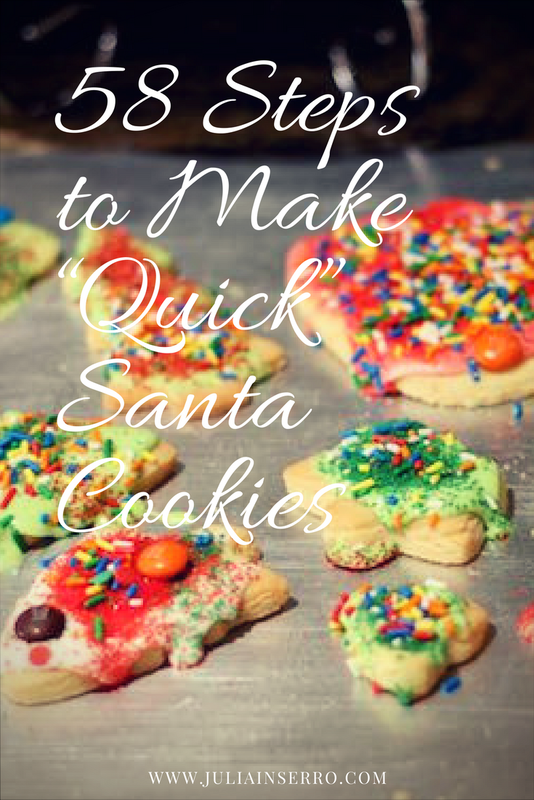 Step 1: Find “quick, easy, no-fridge, sugar cookie” recipe on Pinterest. 3. Suddenly remember we don’t have any aquafaba (chickpea juice) left over after hubby accidentally broke the glass jar last weekend. 4. Pull out can of chickpeas. Spend 3 minutes unwrapping four cans I bought on sale that were sealed together with packing tape. 5. Open can, drain liquid, put chickpeas into pyrex bowl; spend 2 minutes finding compatible lid. 8. Spend 4 minutes looking for kids’ aprons. 9. Remember I hadn’t fed kitten yet; find kitten food. 10. Spend 6 minutes keeping big cats away while kitten eats crunchies. 11. Pull out kitchen scale, get butter. 12. Google how much 1C butter weighs in ounces (8oz, duh). 13. Weigh block of butter; only 5.64 ounces. 14. Get more butter from fridge, start slicing off frozen chunks until read 8.01 ounces. Done! 15. Melt butter slightly in microwave; 33 seconds. 16. Add sugar to bowl with butter. 17. Find beaters for hand mixer. 18. Spend 2 minutes searching for hand mixer. 19. Beat butter and sugar. 20. Add aquafaba and vanilla. Beat more. 21. Find second bowl I’d lost on counter; add flour, baking powder, mix quickly. 23. Combine dry ingredients with wet, beat quickly. 24. Succumb to three munchkins invading kitchen. Gather three aprons, assure 4yo that she’s wearing “hers”. 25. Dig out box of cookie cutters. Let munchkins pick out “a few” (or twenty). 26. Have nanny help “flour” the small table. 27. While nanny rolls out dough, I gather camera to document this wondrous event. 28. Let everyone randomly use cookie cutters; randomness cannot be overstated. 29. Allow munchkins to have their first taste of raw cookie dough. It’s a hit! 30. Tell them to stop eating the raw cookie dough; repeat. 31. Tell 2yo to stop hitting his sisters with the spatula. 32. Shoo kitten away from the table. 33. Allow each munchkin to “use” the rolling pin; watch for sudden movements. 34. Just a mere 33 minutes later, cookies are on trays ready to go into oven. 36. Wait 6 minutes; clean up the flour-bomb residue. 37. Oven beeps, put cookies in. Assure munchkins they can decorate (and eat) later today. 38. 17 minutes later, hot cookies are cooling. 39. 30 minutes later, return to kitchen to prep icing. 40. Use a bag and a half of powdered sugar and more aquafaba; stir, stir, stir. 41. Add in splash of vanilla; repeat stirring. 42. Dig out 8-year-old colored sugar and 1-year-old sprinkles and food coloring. 43. Separate out icing into three bowls; create pale green, pale red (i.e., pink), and white. 44. Note need more (and newer) food coloring. 45. Put red sugar, green sugar, Christmas sprinkles, and M&Ms into individual bowls and put on small table. 46. Retrieve aprons and call in the munchkins; get them prepped. 47. Quickly ice cookies randomly and pass off to the table. 48. Let candy-coated chaos ensue. 49. Turn around to see 2yo piling 15 M&Ms on an “ornament” cookie. 50. Find 4yo pouring a mound of red sugar on a “candy cane” cookie. 51. Find other 2yo eating as many M&Ms as he can. 52. Wrap up the sugar-sprinkle-bomb melee with final three cookies. 53. Reassure munchkins that after naptime we will pick out cookies to save for Santa, and then we can all try our sweet creations. 54. Spend 5 minutes pre-picking our favorite cookie to try later; pick them again. 55. Insist this is that last time we pick our favorite. 56. Spend 10 minutes putting all decorating paraphernalia back. 57. Thank nanny profusely for her patience and help. 58. Vow to do this again; in a year.